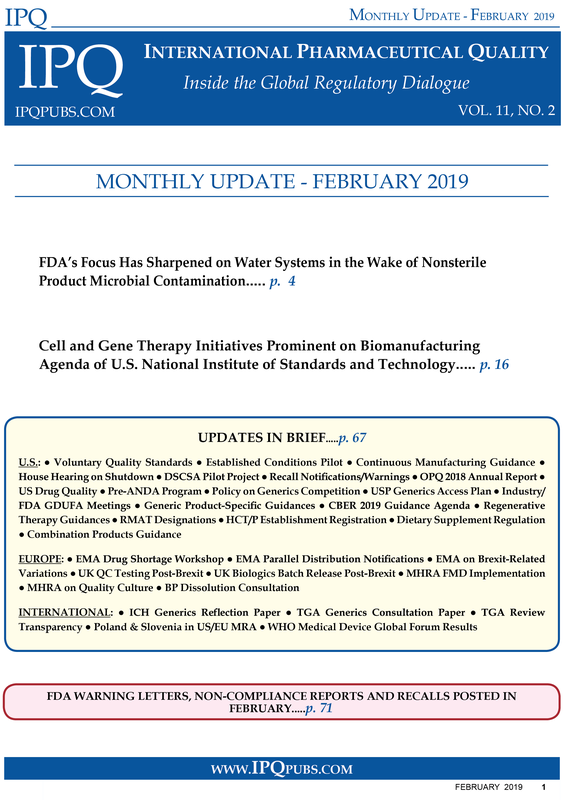 The February 2019 issue provides an in-depth review of: ● FDA’s increased focus on water systems as microbial contamination problems, particularly with B. cepacia, continue to surface around the world in non-sterile as well as sterile products and drive changes to the US and European pharmacopeias, and ● the role of the U.S. National Institute of Standards (NIST), in collaboration with a host of stakeholders, in creating a more robust standards infrastructure to support the complex development, manufacturing, and control challenges presented by rapidly evolving biotech products and processes. FDA has been sharpening its focus on water systems during inspections of nonsterile liquid products as microbial contamination problems of significance in these products continue to surface. The January 2019 issue explores: ● the mission, process, and rapidly expanding project portfolio of the National Institute for Innovation in Manufacturing Biopharmaceuticals (NIIMBL) ● the significant efforts of the Gates Foundation, and its newly formed, biotech product-oriented Gates Medical Research Institute, to support CMC innovation that will increase developing world medicines access ● the issues that pharmacopoeial and registration divergences create globally, and the pathways for addressing them, and ● what it takes for biotech companies to avoid GMP compliance problems that can jeopardize application approvals and create manufacturing pitfalls. Industry, regulatory authorities and pharmacopoeias continue to explore ways to address the difficult challenges of complying with and harmonizing compendial and regulatory requirements in the effort to ensure and enhance the availability of medicines around the world. The December issue provides updates on FDA/CDER’s Office of Generics Drugs and Office of Pharmaceutical Quality – what have been the key areas of focus over the past year and what the top priorities are going forward. The third story crosses the Atlantic to explore how Brexit is impacting the MHRA in the medicines arena and what the agency is doing to prepare for what may happen. The Bill & Melinda Gates Foundation is stepping up its commitment to helping solve the complex chemistry, manufacturing and control (CMC), regulatory, financial, and distribution challenges of providing quality medicines for developing countries. Technology roadmaps specific to vaccines, gene therapies, and antibody drug conjugates (ADCs)/bispecifics are the first of the many impactful industry/government/academia collaborative projects in the National Institute for Innovation in Manufacturing Biopharmaceuticals (NIIMBL) portfolio to reach completion.